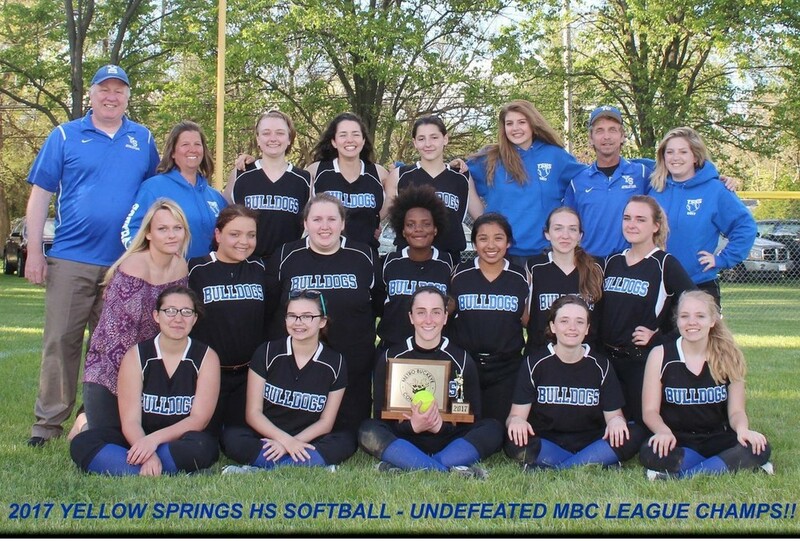 The Yellow Springs girls softball team celebrated a 1st place undefeated season in MBC play with a convincing 13-3 win against Middletown Christian last night. The win clinched 1st place for the Bulldogs as they went undefeated in conference play with a final record of 6-0 in MBC play. The score was tied 2-2 until the Bulldogs broke loose to score 3 runs in the 2nd inning behind hits by Hannah Morrison and Elly Kumbusky. Morrison was a one man swat team on offense for the Bulldogs as she had 6 RBI's and went 3 for 4 at the plate with two long doubles and a triple to deep left field. Other offensive stars were Elly Kumbusky, who went 3 for 3 with 3 RBI's, Kadie Lafferty who flew around the bases to score 4 runs for the Bulldogs, and Gracie Price who was 2 for 3 with a long double and 2 runs scored. Hannah Morrison pitched a complete game for the Bulldogs to get the victory as she improved her record in MBC play to 6-0.